Recipe video above. 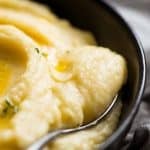 This is mashed potato as served at top tier restaurants. It's soft and almost pourable, intensely buttery and has a more pure potato flavour. Restaurants double pass the potato through a mill then a fine sieve so it's 100% lump free. For this home version, I simply pass the potato through a ricer OR mash it. Nobody notices the imperfections because they're too focussed on the amazing flavour and the creamy yet fluffy texture! Alternatively, peel then chop into 2.5cm / 1" cubes (Note 4), cook 12 to 15 minutes until soft. 1. Potato - For the best results, use the following potatoes - Australia: Dutch Cream, Desiree or blue royale. US: Use Yukon Gold. UK / Europe: Use Maris Piper or Desiree. Otherwise, use any all rounder potatoes. I've made this with Segbao which are the dirt brushed potatoes that are the most popular all rounder here in Australia. The potato flavour is slightly better with the recommended potatoes but the texture was very similar. For best results, use even sized potatoes (so they cook at the same time). 3. Milk - any cow's milk is fine, there's so much butter in this, no one would know if it was full or skim milk! I prefer milk to cream because the cream flavour can overwhelm the dish and sometimes give it a greasy mouth feel (depends on quality of cream). I like pure unadulterated butter + potato flavour. 4. Cooking the potatoes whole is optional - flavour is slightly better because the potatoes don't get waterlogged. But difference is not significant so if you prefer to take the easier path, peel potatoes then cut into 2.5 cm / 1" pieces. Place in pot, cover with cold water and cook for 10 - 12 minutes until soft, drain then proceed with recipe. 5. Keep warm: Cut a circle using baking paper (parchment paper) and cover surface, pressing down to remove any air bubbles. This will prevent skin from forming and keep it warm for a good 30 minutes or so. Store the mash like this if you have leftovers. 6. To reheat, I honestly believe the best way is in the microwave. It keeps it moist, and the consistency can be adjusted with a small splash of warm milk. Alternatively, pour a small amount of milk in a saucepan over medium heat. When it is hot, add the potato and stir gently until it heats through. Use more warm milk to adjust the consistency. 7. Serving Quantity - this is RICH! Most people only need 2 or 3 heaped tablespoons. 8. Adapted from Guillaume Brahimi's famous Paris Mash recipe.